*For a quality experience for our campers a minimum of 6 participants is required. If that minimum is not met, we will offer you a choice of moving to a different session or refund your deposit. Climbers of all skill levels are invited to spend the summer climbing the walls at Atlanta Rocks! Children ages 8-16 will enjoy the challenge and excitement of rock climbing in the south’s most popular, climate-controlled, indoor training arena. Atlanta Rocks! Climbing Camp provides unparalleled climbing instruction using a child-centered approach to teaching. Beginners will learn the basics; including how to put on a harness, tying safety knots, proper belay procedures and introductory climbing technique. For intermediate climbers, camp will focus on developing better footwork, improving balance, and enhancing overall performance. Climbers will learn to belay and climb with each other and are expected to follow safety rules. Camp fee includes use of climbing shoes, harness, and belay device. Please pack a sack lunch for your child each day. Drinks and snacks may be purchased on site. To download Atlanta Rocks! 2018 Summer Camps Brochure, please click here. Whether your child is an accomplished scrambler or still needs to “learn the ropes,” Atlanta Rocks! experienced instructors will create a learning environment that is fun and challenging and tailored to the unique needs of each climber. Camp size is limited and space is assigned on a first-come, first-served basis. A $50 non-refundable registration fee per child per session is required. Your non-refundable registration fee will be applied to your camp fees. All camp fees are due in full on or before the first day of your child’s camp session. All climbers under 18 years of age must be accompanied by their parent or legal guardian to sign the required liability waiver on their first visit. The July 5, 2004 edition of the Atlanta Journal-Constitution, featured Atlanta Rocks! 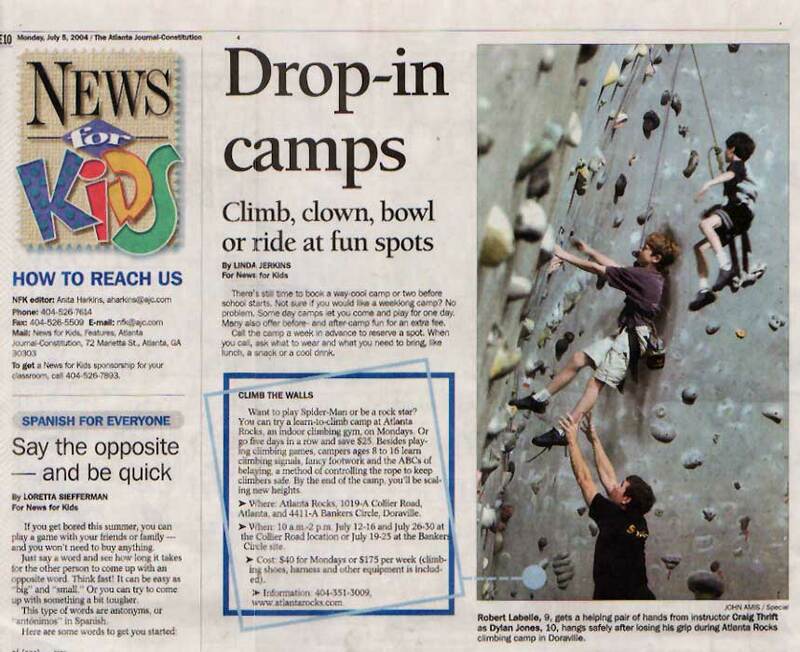 Climbing Camps in its News for Kids section. View the feature here. One of Atlanta Rocks! summer camp dads filmed his son Justin for half a session and put together this neat video to record the fun he had at rock climbing camp. Thank Goodness it was indoors or else the 95+ degree heat would have melted everybody.